I’ve finally finished this game, and it’s available on all platforms. Well, nearly all platforms. I released it on Google Play for Android four days ago, and on iTunes this morning. As an afterthought, I decided to publish it for PC and Mac as well (although I personally prefer using swipe gestures on a touchscreen, instead of a mouse). Download it here! Midair Madness comes with a smaller price tag, compared to my other games. This game is pretty basic, and nowhere near as in-depth as our other games such as Airport Madness 4 or Radar Chaos: Hawaii Edition. Enjoy! I’m patiently waiting for Apple to approve our latest mobile game, Midair Madness. While it typically takes 6 days to get approved by iTunes, it took Google Play approximately 0.14 seconds to approve the Android version of this game. The Android version has been quietly sitting on their App Store for two days now, waiting for it’s iOS counterpart to be approved, before I start actively promoting them. I call this an experiment, because I only spent two weeks building Midair Madness. My last app, Backyard Brat, was also an experiment. Kind of a failed experiment, actually. Oh well, that’s how we learn, I guess. But Midair Madness shows promise. Family and friends who played the beta version played it for 10 minutes, before putting it down. Backyard Brat would get handed back to me after only 20 seconds, with a polite, “Nice game!”. Family and friends always give you a 5-star rating for whatever piece of garbage you create. But the Real World does not hesitate to give you only one star for your garbage app. I do hope this game takes off (no pun intended). If it doesn’t, I’m ok with that. I’ll keep trying new things, as I endeavor to expand this tiny niche market. 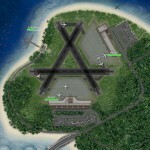 I’m simultaneously working on Airport Madness 2 and 3 for Android, hopefully coming out in early May. As well, Radar Chaos: World Edition is being developed for all platforms. I will have another screenshot up by tomorrow for you. Here’s the official product page for Midair Madness. We’ve just submitted Midair Madness to iTunes and Google Play. It’s now available on Google Play, and should be in the iTunes App Store by April 24, 2014. Avoid midair collisions! Direct jetliners away from each other. 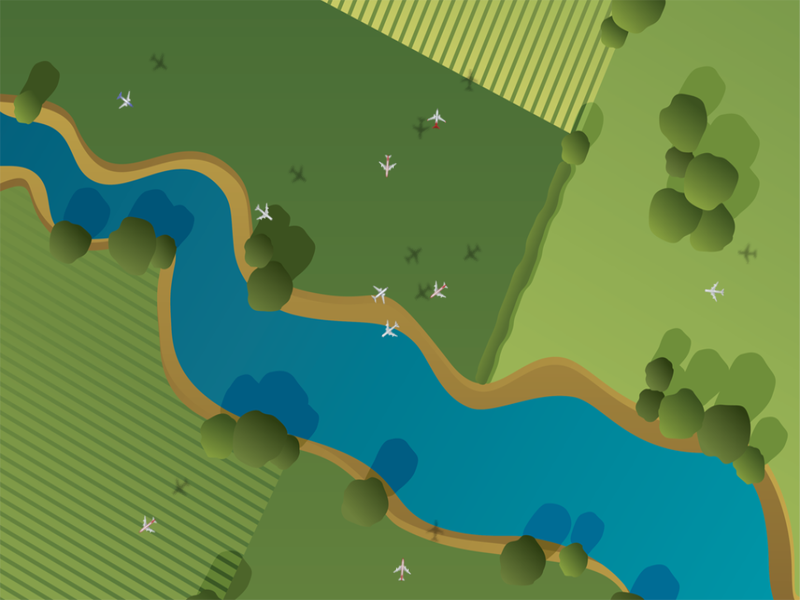 This game is easy to learn, difficult to master, and extremely addictive.Inspired by our Airport Madness series, Midair Madness is a fast, simple air traffic control game that requires no learning. Just swipe the airplanes to assign them turns.Keep your eyes moving! Keep your fingers moving! Can you achieve a 3-star rating on all six levels? This week has been all about Android for me. I’ve successfully ported three of my games over to that platform, but it remains to be seen how successful these games will be. I’m getting a great deal of feedback from users, both through email and app store reviews. Generally, the games seem to run fine, based on the 4.5 star ratings I am seeing. Usually, the only vocal people are the ones who are finding the bugs, and there are a few. I’m steadily working to make these apps solid for the users. As I do all of this, I am simultaneously working on a new idea, which came to me last week, out of nowhere. It’s called Midair Madness, and it will be a mobile app only. Airplanes streak across the sky from all directions, and you must steer them to avoid disasters. The game is very simple to play. And in fact, it’s been simple to make. I’ve robbed many of my previous games for code, and I am buying artwork, as opposed to using an artist of my own. This speeds up production in a big way. When this light bulb came on inside my head last week, I challenged myself to finish the game in one week flat. I guess I’m getting faster at dealing with code, with graphics, and App Store red tape. As of this morning, it’s already been two weeks. But the good news is that it’s almost finished. My casual games have never done anywhere near as well as my ATC games have (with the exception of Office Jerk in 2011). However, this casual game involves controlling airplanes. It will have six levels and isn’t nearly as in-depth as Airport Madness or Radar Chaos. Each session will typically last between 30 seconds and 2 minutes. I hope to have Midar Madness in the app stores within a couple of weeks! This week I’ve been busy porting several of my iOS games to the Android platform. It’s something I’ve put off long enough, and so I am now jumping in with both feet. I’m currently offering Airport Madness 4, Airport Madness: Time Machine, as well as Approach Control. These games have shown promise on the iOS App Store, so it made sense to bring them over. Moving forward, upcoming games such as Radar Chaos: World Edition and Airport Madness: World Edition will be available for all platforms, immediately upon release. Here is a sneak preview of an upcoming mobile game of mine, Midair Madness. This game is in its’ very early development stages, but the video should give you an idea of what’s going on. The player must swipe planes to turn them and avoid collisions. This game is kind of an experiment. I’m challenging myself to complete it within one week, and submit it for sale on all app stores for a buck. We’ll see what happens!